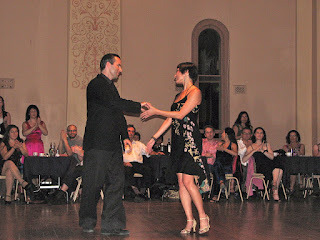 The milonga at Glebe Town Hall became a fixture run by teachers Peter Waller and Lisa De Lazarri. It grew to be a weekly event, long before there was even one milonga on each Saturday, and it was the scene of many of the highlights of the first years of tango in Sydney. Visiting teachers were a treat, and came once or twice a year - and when they did they usually performed at Glebe. The Tango Championships were first held in 2005 and Glebe was one of the main locations for the heats. It was stifling hot in summer and freezing in winter, but we regularly met up despite the weather, and afterwards many would make their way to a local cafe to carry on talking tango. So when Peter and Lisa were told in 2011 that the Town Hall, which is heritage listed, was being renovated, they moved their milonga to another inner city venue. But it didn't have the tango history. So I am delighted that tomorrow night, Glebe Town Hall will once again host a milonga. As a history buff I am keen to see how it has been renovated - after all it is 132 years old. And I am keen to once again experience a milonga on the beautiful wooden floor. This is a photo of a performance by Murat and Michele Erdemsel in October 2008 - that shows some of the features. And here are the details of the milonga.